Clinton or Obama? McCain or Huckabee — or Paul? Should the school budget pass? What about the Moran plant? Vermonters will decide these questions and more on Tuesday. And this year's Town Meeting Day promises to be an exciting one. All the more reason to share your election day stories on the Exit Voices blog! 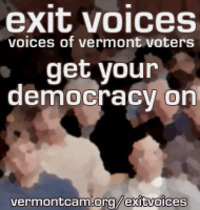 Exit Voices is a "Vermont blogging experiment" sponsored by the Burlington-area cable access channels — 15 (VCAM), 16 (RETN) and 17 (CCTV). It's moderated once again by Vermont blogger and filmmaker (and VCAM producer) Bill Simmon. Exit Voices is a forum for Vermont voters to come together and discuss the issues and candidates on the ballot. 1. What motivates you to go to your town meeting or polling station and vote? 2. If you could add a comment on your Ballot for your elected officials to read, what would you say? Alternately, tell us what you said at your Town Meeting, why you refused to vote, or what makes you crazy about our system of democracy. I've participated in Exit Voices in the past. I love checking in to read other peoples' accounts of their polling places. In fact, I love it so much that I convinced our editors to run some of the comments in the paper. Next Wednesday's edition of Seven Days will reprint some of the content from the Exit Voices blog. I've got to start curating these comments by 2 p.m. on Tuesday — sadly we've gotta send the paper to print before the election results are in. So consider this my first plea to all of you Vermont bloggers to post early (and often!). Your words could wind up in Seven Days. Thanks for the plug, Cresmer! You know, you can participate too!